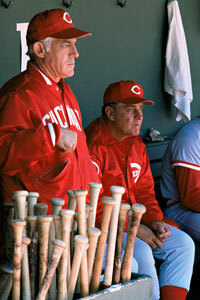 He managed both the Cincinnati Reds and Detroit Tigers to World Series Championships. 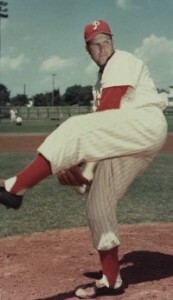 He played Major League Baseball for exactly one season, 1959, with the Philadelphia Phillies. He spent a long time in the Brooklyn Dodgers organization as a player and began managing in the minor leagues in Toronto. I grew up as a kid watching baseball in the 1960′s and 70′s, so I got many memories of Anderson led Reds teams. Though my favorite team was the New York Mets. The Reds and Mets played a NLCS in 1973. After a fight broke out between Bud Harrelson and Pete Rose, Met fans started throwing garbage on the field. Anderson pulled his team from the field for safety purposes. I didn’t blame him then or now. Anderson was nicknamed Captain Hook because of his tendency to pull starters quickly while managing the Reds(Wouldn’t you if your best pitcher was a Don Gullet who couldn’t be worked too hard, backed up by Fred Norman, Jack Billingham, and Gary Nolan?) but in his later days he swung to the other extreme. He stuck with his mediocre starters in Detroit. RIP George Anderson. Anderson, who directed the Big Red Machine to back-to-back championships and won another in Detroit, died Thursday from complications of dementia in Thousand Oaks, Calif. He was 76. A day earlier, his family said he’d been placed in hospice care. 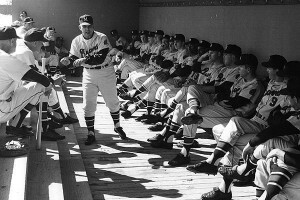 Anderson was the first manager to win World Series titles in both leagues and the only manager to lead two franchises in career wins. Anderson’s teams in Cincinnati — featuring Johnny Bench, Joe Morgan and Rose — won crowns in 1975 and 1976 and rank among the most powerful of all-time. Led by Kirk Gibson and Alan Trammell, Anderson won with the Tigers in 1984. Don Larsen is the only other pitcher to throw a postseason no-hitter. He threw a perfect game for the New York Yankees in the 1956 World Series against Brooklyn. The 54th anniversary of Larsen’s gem is this Friday. 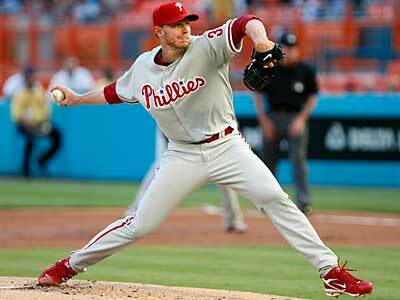 Halladay took the Year of the Pitcher into the postseason. The excitement spread beyond Citizens Bank Park — the last two outs were shown on the video board at Target Field, where the Twins were preparing to play the Yankees, and Minnesota fans cheered. The All-Star right-hander, who tossed a perfect game at Florida on May 29, dominated the Reds with a sharp fastball and a devastating slow curve in his first playoff start. The overmatched Reds never came close to a hit. 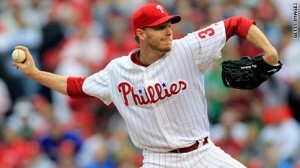 Halladay allowed only runner, walking Jay Bruce on a full count with two outs in the fifth, and struck out eight. I’m going to say this again. 2010 is not t he year of the pitcher when it comes to baseball history. 1968 wins it hands down. How many hitters hit over .300 this year in the AL? More than one that was the 68 total. Did 1/5th of the games played this year end in a shutout? No. Was either league batting average below .235? No. The thing is, it isn’t even close. MIAMI (AP) — Philadelphia Phillies ace Roy Halladay threw the 20th perfect game in major league history, delivering the marquee performance of his All-Star career in a 1-0 win over the Florida Marlins on Saturday night. It was the second perfect game in the majors this month alone, Dallas Braden doing it for Oakland against Tampa Bay on May 9. It’s the first time in the modern era that there were a pair of perfectos in the same season — Colorado’s Ubaldo Jimenez threw a no-hitter, too, in April. Halladay struck out 11, then got pinch-hitter Ronny Paulino to ground out to end it, and was cheered by a crowd of 25,086 throughout much of the night. While there were a couple of good plays behind him, Halladay didn’t need any great defensive work in this gem. This is the first perfect game pitched for Philadelphia since Jim Bunning, now a Senator from Kentucky, did it on June 21, 1964. It is also the first time in the modern baseball era that there have been two perfect games pitched in the same season. This did happen once during the 19th Century baseball era; in 1880 when Lee Richmond of the Worcester Ruby Legs pitched a perfect game on June 12th, and John Montgomery Ward did it for the Providence Grays five days later on June 17th. Jim Thome has 57 career home runs against the Minnesota Twins, more than any other player in team history. For the 2010 season, at least, that number will go static as the 39-year-old slugger works on the number of homers he can hit for the Twins. Thome, who turns 40 in August, agreed to a one-year, $1.5 million contract with the Twins on Tuesday, pending a physical he will undergo this weekend. The move came one day after White Sox manager Ozzie Guillen announced that Chicago would not re-sign the designated hitter. Thome also can earn up to $750,000 in incentives. Thome said the Rays and White Sox were his other suitors. Guillen told reporters Chicago would not bring Thome back because the team would have trouble finding enough at-bats for him. Thome said neither Chicago nor Minnesota promised him a certain number of at-bats and that he decided on the Twins for two reasons â€” Minnesota showed the most interest and he wanted to return to the American League Central, where he is familiar with pitchers he’ll face. What team guarantees what number of at-bats a player should get? If any do, they’re nuts. If a franchise is serious about winning, you use the players that can most help you do that. A veteran who can’t produce, will be benched by a well run team and in a worst case scenario, released out right. That said, Thome can still be useful as a role player. He still has some pop in his bat, and that and the length of his contract make his signing look like a reasonable move by Minnesota IMHO. 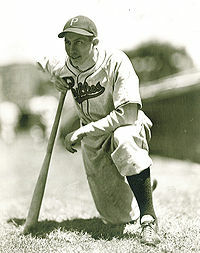 He played for the Phillies from 1939 to 1942 and for the Cleveland Indians in 1945. RIP. Stan Benjamin, a former scout for the Houston Astros, passed away Thursday at the age of 95, as announced by the team. Benjamin joined the Astros in 1965 and worked in the organization for nearly 40 years, evaluating talent as a scout at the amateur and professional levels. His duties included serving as a Major League scout covering the American League East clubs for several seasons. Benjamin also served as Houston’s amateur scouting supervisor for the Northeast section of the country. “Stan was a vital cog in the Astros organization,” said Astros president of baseball operations Tal Smith in the team’s release concerning Benjamin’s passing.